He was a plant trapped in a man’s body. She was a woman trapped in a plant’s body. Theirs was a love like the world had never known. They called themselves transplants and for years they suffered in silence. But with a courage hitherto unseen in the annals of botany, they rose up to demand their rights. Transplant is a story of love and betrayal, heroism and photosynthesis, the story of tomorrow’s headlines today. 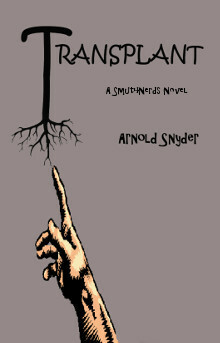 If you want to read Transplant for free, click here. To purchase Transplant at Amazon, 2.99/Kindle or 8.99 paperback (a thoughtful gift if you have a friend with a perverse sense of humor), click here. See also: Pink Wedge, yet another Smut4Nerds Classic, here.